Nimesh, Prina and you can make this very easy smoothie. That will be her present to you. Am sure she will be tickled to bits and you in the process will enjoy a cool drink. If you can’t make it today then thats a plan for next Sunday. 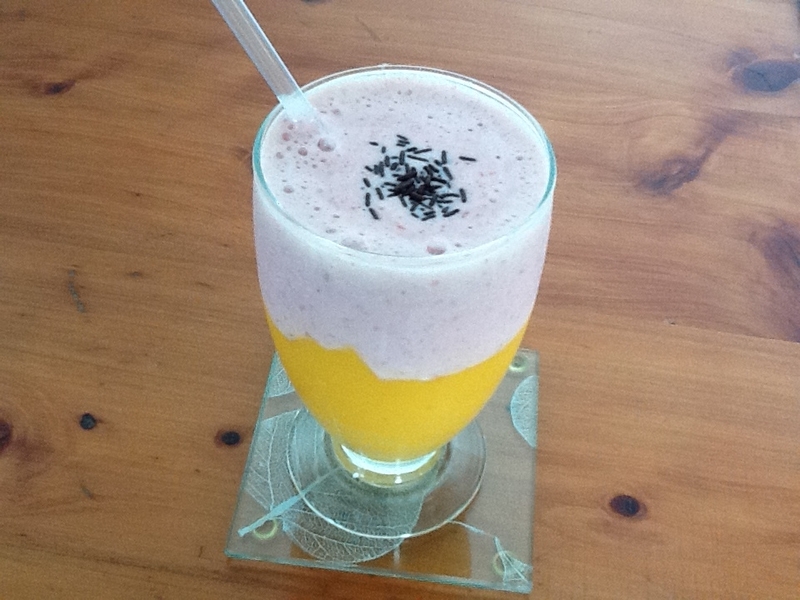 Daughter and father in the kitchen with a blender.I know you love milkshakes, smoothies, ice creams so you will surely enjoy this one. Prina can have a few strawberries as she may no drink the smoothie. Wash and hull the strawberries. Cut into half and freeze them. Layer them in a tin and not piled. You don’t want one solid mass of strawberries. Puree the mango pieces with ¾ cup milk. Keep it on one side. Puree the strawberries with sugar and remaining milk. Divide the mango smoothie into 2 tall glasses. Pour the strawberry smoothie on top. Can serve as a dessert. Add a dollop of ice cream on top. Serve with a few chocolate chips.